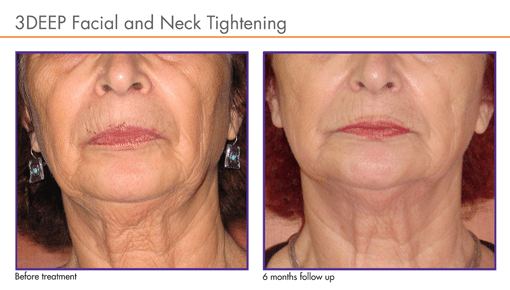 Smooth, tighten, lift, and tone skin with this cutting edge non invasive treatment! A multi-source, phase-controlled radio frequency energy that is state-of-the-art, safe and effective. 3DEEP represents the latest generation in the evolution of RF-based treatments. Radio Frequency is FDA approved to smooth, tighten, lift, and tone skin. RF treatments is also FDA Approved to eliminate cellulite, melt fat cells and promote a more contoured body. EndyMed’s unique, FDA cleared 3DEEP technology is an innovative multisource RF technology that delivers controlled, focused RF energy deep into the skin, without any pain or risk, reactivating the skin’s’ natural collagen production. By focusing RF energy deep within the dermis, 3DEEP stimulates collagen renewal without overheating the epidermis, eliminating any potential side effects and the need for cooling. RF treatments are the trendy aesthetic solution of the moment. Everyone is looking for a quick, easy and pain free non-invasive treatments to tighten and contour their face and body. There are a number of different treatment options available today, but effective, consistent visual results are the key to successful treatments and patient satisfaction. EndyMed invests more in clinical research and validation on our products and treatments, because we know that the key to our success comes from the tremendous investment we make in clinically validating our treatment results. Our products have been clinically proven by internationally renowned dermatologists to provide your patients with consistent impressive results that you can trust. Our clinical validation program has produced over 40 peer reviewed clinical studies that have been published in international industry publications, proving that EndyMed offers the results your patients expect. Radio frequency is an expensive procedure that goes by fancier names, too, like Thermage and EndyMed. It heats up deep layers of skin, causing controlled damage that stimulates new collagen and firms the skin. Some dermatologists start patients in their 30’s on it with the goal of mitigating aging down the road. Others swear by it for tightening sagging tissue along the jaw. Many who use it do so in conjunction with fillers, though. “If a face-lift is a home run for lifting the jaw, radio frequency is like getting to second base, and sometimes that’s enough for patients to stop obsessing over that area,” says Wechsler. “But it doesn’t work well for smokers, sun worshippers, or yo-yo dieters, because all those things break down new collagen in the skin.” And sometimes even nonsmoking vampires won’t create enough collagen to be happy with the results: “A concern is it doesn’t work optimally for all patients, and it can be difficult to know who’s going to respond best,” says Hirsch. 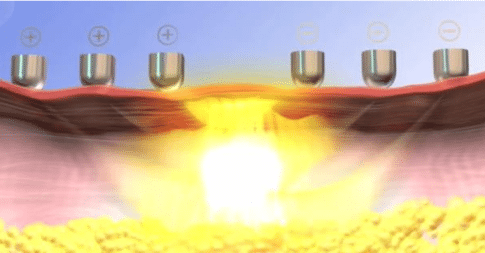 3DEEP™ proprietary multi-source, phase controlled RF technology successfully manipulates the interaction between multiple RF energy fields to achieve the desired 3-dimensional thermal pattern in the target area. 3DEEP™ uses an array of several electrodes and a sophisticated algorithm that manipulates the phase of current flowing between each pair of electrodes. The multiple electrical fields created repel each other, leading to the ideal combination of energy directed to a deeper skin layer. The repelling forces between adjacent electromagnetic fields drive energy vertically into the target tissue, reducing the amount of energy flowing through skin surface and alleviating the need for cooling. 3DEEP™ targeted skin therapy implements the interaction of multiple energy sources for controlled delivery of energy to the dermis and hypodermis. The unique energy delivery mode minimizes the risk to the skin surface or surrounding tissue for an optimal aesthetic result. Selective phase-controlled heat delivery to the collagen fibers results in an immediate skin tightening followed by a second stage of collagen remodeling for anti-wrinkle effect. The Vi Peel- Get rid of pigmentation fast!